The army of "Outlandish Mini Figure Guys" is growing. First launched in 2011 with an initial set of five figures followed by a second one early this year, the O.M.F.G. 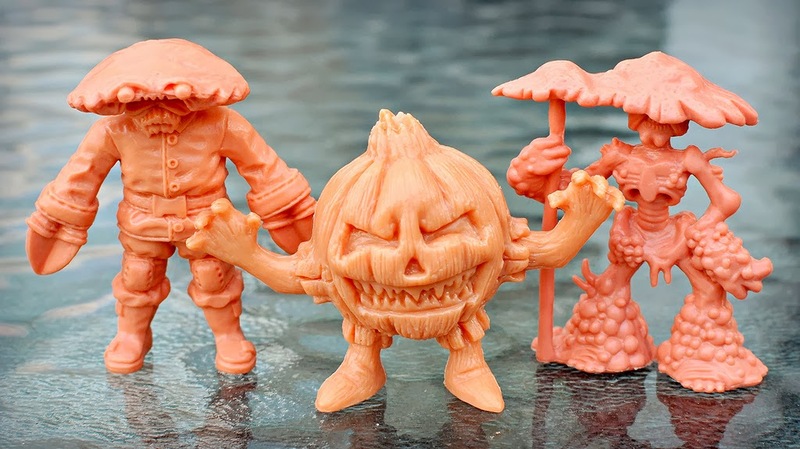 mini figure line is now up to 15 sculpts with the release of its third series this Fall. 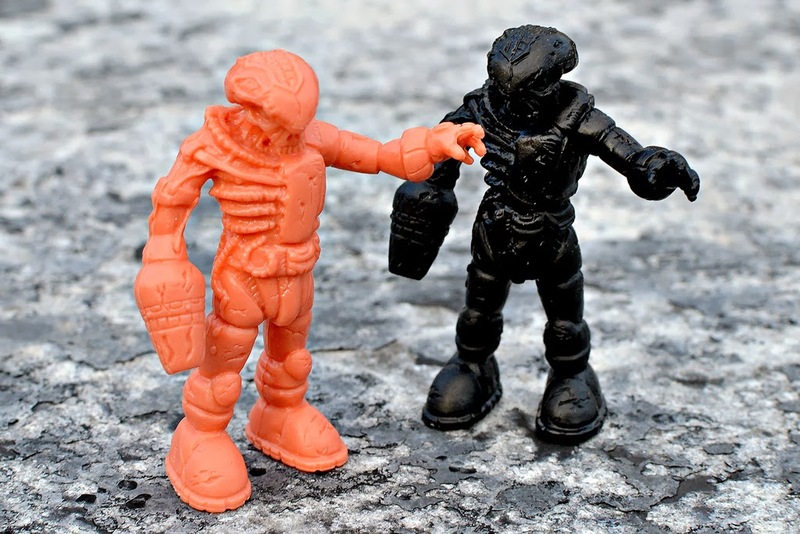 This new set of five plastic figures was once again funded through a Kickstarter campaign from October Toys, after its characters were chosen by popular vote from fan-submitted concepts on the October Toys forum. I've got Series 3 in standard flesh and black sets that were offered through Kickstarter, as well the very eye-catching metallic gold color that is available as an exclusive through LukesToyStore.com (Luke's Toy Store has also offered Series 1 and 2 in metallic gold). 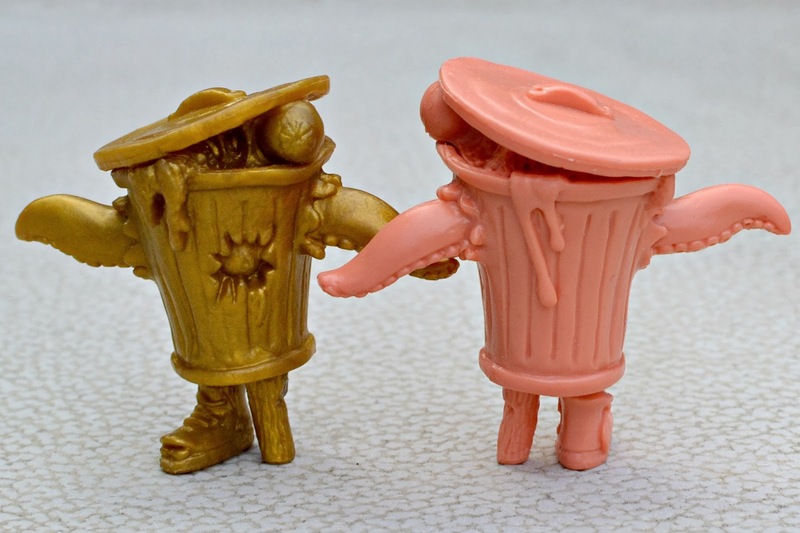 The flesh color is a bit different than it was for Series 2 figures; it's deeper and more pinkish, closer to the flesh color of the Series 1 figures. Check out the photo to the right to see what I mean. As for the gold, it's always one of my favorites for O.M.F.G. The details really pop in this color, and you don't find too many gold mini figures, so it definitely adds extra appeal. From what I've read, DR. DECAY seems to be the fan favorite of this set, and I can't argue with that. 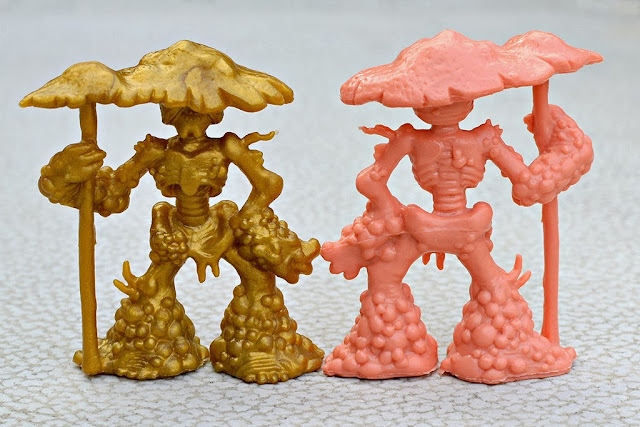 This skeletal-fungus dude makes for a truly awesome figure. He's just so crazy-looking, and definitely lives up to the "outlandish" part of the toy line's name. I love his pose and the bumpy details on his arms and legs. It's just a wonderfully-designed figure all around. If Dr. Decay is my favorite of the set, then FRUIT PUNCH has got to be my second favorite. I believe this character started life as a milk carton, but was then changed to be a juice box at some point in the process. To be honest, whenever I saw photos I had considered him to be too much of a novelty character for my taste and I didn't think I'd be too into the figure, but having it in hand changed my opinion. It's a fun little sculpt that adds some good variety to the line, as most of the other figures are considerably larger. 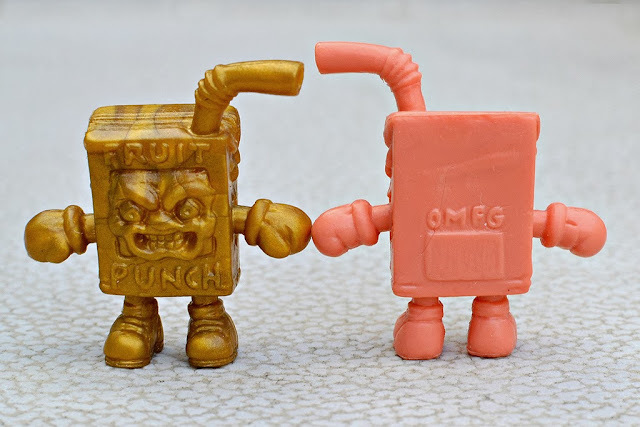 I was always a sucker for the little-guy MUSCLE figures, and Fruit Punch definitely brings those to mind. BARBARIANAUT is another figure I ended up liking quite a bit more once I got it in hand. From photos I thought I might ultimately find it a bit bland, since I tend to prefer the crazier, more monstrous characters. But once I got the figure, I found the sculpt to be very nicely done, and I do like the concept of spaceman-meets-barbarian. I think he's also the only O.M.F.G. figure to date that's wielding weapons, which adds to the coolness factor, for sure. TENCAN is the second most monstrous character in Series 3, after Dr. Decay. It's a tentacled creature that's taken over a trash can (and is using it as body armor, maybe?). I can always get behind a tentacled monster, so of course I like this figure. I do think I would have preferred more tentacles sticking out from the bottom of the can instead of the wooden peg and a foot, but that's not a big deal, and it does still stand up fine the way it is. One of my favorite elements is the big eyeball peeping out from under the lid. It's fun to imagine what the rest of the monster in there looks like. From what I have read, PUGNACIOUS has taken his share of flak, with some people saying he's a boring figure. It's true that the concept isn't incredibly outlandish, basically being a barbarian/wrestler guy with a dog's head. 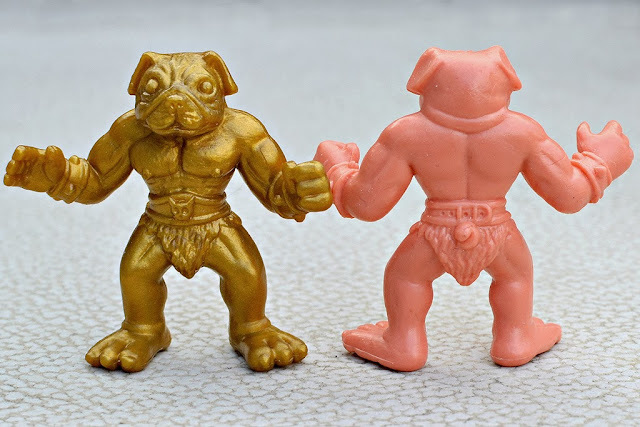 It reminds me of the handful of animal-head wrestler characters from MUSCLE. That said, having this figure in hand, I actually find it to be pretty charming. There's something about the simplicity of it that I admire, even if it's not the most exciting of the bunch. BONUS: These ZOMBIE PHEYDEN figures came with all O.M.F.G. Series 3 Kickstarter pledges of at least $25, even though they aren't actually O.M.F.G. figures (they're actually considered part of the October Toys Mini Figure line). It's a nice sculpt, although I'd imagine people who are into collecting Onell Design's Glyos toys (where the Pheyden character comes from) would be the most excited about it. And that's O.M.F.G. Series 3. What's your take on the new figures? How do you think this series stacks up against Series 1 and Series 2?